Such was Queen's popularity in 1986 that, after selling out Wembley Stadium for two nights, an additional date in Knebworth had to be added to the end of their A Kind Of Magic tour to accommodate the demand for tickets. 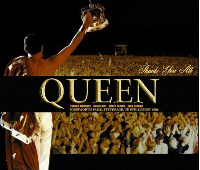 Between 120,000 - 150,000, depending upon the estimate, showed up for what would turn out to be Queen's final concert with Freddie Mercury. 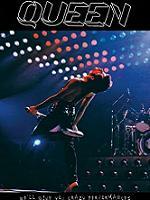 In the intervening twenty years this show has attained legendary status and is essential for any fan of Queen. Since it is assumed that Freddie did not know he was infected with AIDS until afterwards, nobody could have guessed this would be the last. Thank You All follows other Wardour releases as One Sweet Moment and Spectacular by presenting the show on both audio cds and a dvd of the event. The audience recording is one of the very best from this tour. It was issued before on Electric Magic (AMS-728) on the Amsterdam label released many years ago. Wardour obtained the master from "Crazy S" and this version is a clear upgrade over the older title. Some claim this tape would be excellent except for a lack of a lower end, but this sounds fine. It may very well be top heavy and there are hints of distortion, but the range and dynamics of the tape are a real joy to listen to and it is a miracle that such a good tape exists for this show. 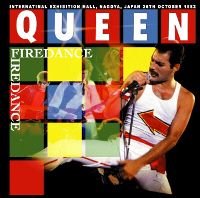 It captures the show from the beginning of the pre-taped intro to "One Vision" and is complete all the way through to the final announcement by promoter Harvey Goldsmith. Some comments by the audience are audible and someone by the tape sings along to the opera section in "Bohemian Rhapsody", but on they whole they occur between songs and are not intrusive. For the event Queen were supported by Belouis Some, Big Country, and Status Quo before taking the stage just as the sun was setting. "This is what you wanted and this is what you're gonna get...now you've got to put up with us" Freddie says after "Tie Your Mother Down". 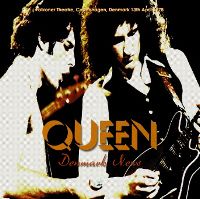 On previous tours the medley section included more songs and usually lasted close to twenty minutes, but on the Magic tour it is only three songs with "In The Lap Of The Gods...Revisited", one verse of "Seven Seas Of Rhye" and a bit of "Tear It Up" before leading into "A Kind Of Magic". The immense crowd keeps up well with Freddie during the vocal games and he promises, "I'll get you after a couple songs, you wait". 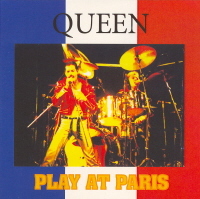 "Another One Bites The Dust" is introduced as a boogie and the audience do not keep up with the vocals prompting Freddie to say, "I told you I was gonna get you" On all the stops before they play "Who Wants To Live Forever?" Freddie speaks about the break up rumors and he addresses the audience by saying, "how can you split up when you have an audience like this? We're not that stupid." 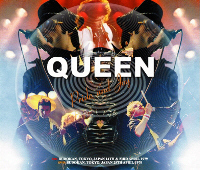 Queen play the longest acoustic set on this tour with the rockabilly numbers being added to "Love Of My Life" and "Is This The World We Created?". The set ends with "Crazy Little Thing Called Love" with people by the taper commenting on the "superb sound". The standard encores beginning with "Radio Ga Ga" are played before Goldsmith comes onstage to announce the end of the show and to point people to the exits. 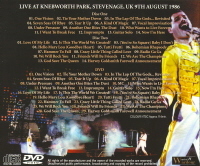 the DVD in the set is the complete concert shot from a member of the audience on his camcorder. It looks as if he is at the very back of the field and doesn't try to record the actual action on stage. Luckily Queen used a huge video screen at the top of the stage to give the audience great close ups of the action and the taper keeps his camcorder on that. Only occasionally, like to tape the giant balloons during "A Kind Of Magic", does he move the lens. There is also minimal audience interference like during "Radio Ga-Ga" which captures people's raised hands. Luckily he has a steady hand and the images are very stable giving us an amature-professional source. Wardour did a flawless sync job of the excellent audience recording with the video. The pictures are pretty clear although the clarity is hampered by the limitations of the tall screen on which the images are show. Queen collectors have been asking about the professional shot footage from this important show but management has denied its existence. 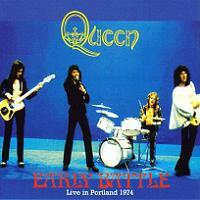 This job by Wardour is probably the best we'll ever have for the final Queen show. The artwork contains several pictures showing just how big the event was. 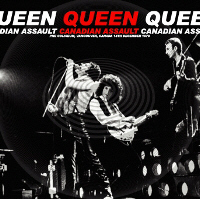 Wardour released several Queen titles the past couple of weeks and this one is pretty close to definitive status for this must have show unless professional sources somehow are located and released.